Multichrome flakes are still big. I think that 2015 is going to see loads of them. 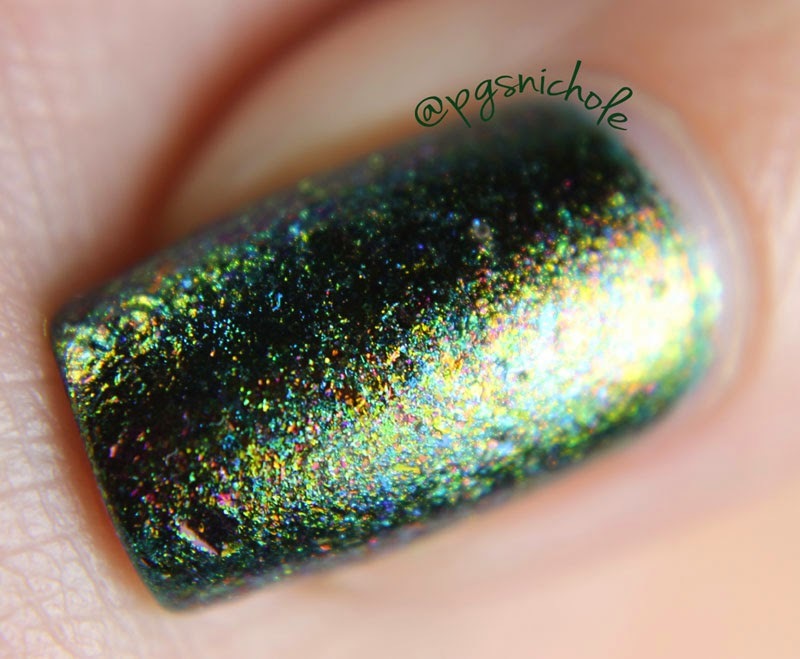 I even picked up ILNP Supernova (as did Amanda) though I haven't shared all of my pictures with the world yet. I am not sorry I grabbed the ILNP topper, but I wish I had waited a bit. There are so many different ones now! Demi from Baroness X sent these to me as a gift, and while I haven't swatched them solo yet, I had to do some art with them. I was wearing CNC Teal The Deal, and these two flakes were sitting on my desk. I knew I wanted to finally try to make an antiqued metal manicure. I applied both top coats with a sponge to get an opaque coat, and I love the final outcome. I tried it over black on my right hand...but it just wasn't the same. I think black is just too dark. Now that there are hundreds of these flake top coats out there, which are your favorites? Are there any I should be looking at? Or any proper polishes featuring these shiny little guys? I've been lusting after Digital Nails The Dude Abides for a few weeks now, I just can't seem to catch it in-stock. I keep pondering those Digital crème/flakies, too. I grabbed 5 of the ILNP ones when they came out, and have really liked all of them (each one looks so different over different undies!!) but now that 8 dozen makers each have their own versions, I really wish that someone would post some comparisons! I am definitely keeping an eye out for similarities. I only grabbed one ILNP (supernova), and neither of these is a dupe for that one. I'm not sorry I bought the ILNP because it does feel very fancy (I am a sucker for a good package) but I'm glad I refrained from buying a bunch of them. Psst, The Dude Abides is in stock right now in Digital Nails etsy shop! (guess whats open in another tab?) I am trying not to buy anything until my untried box is empty. I picked up Natural, Zesty Enterprise from Digital Nails and I LOVE IT. If The Dude Abides is anything like NZE, then it'll be awesome. 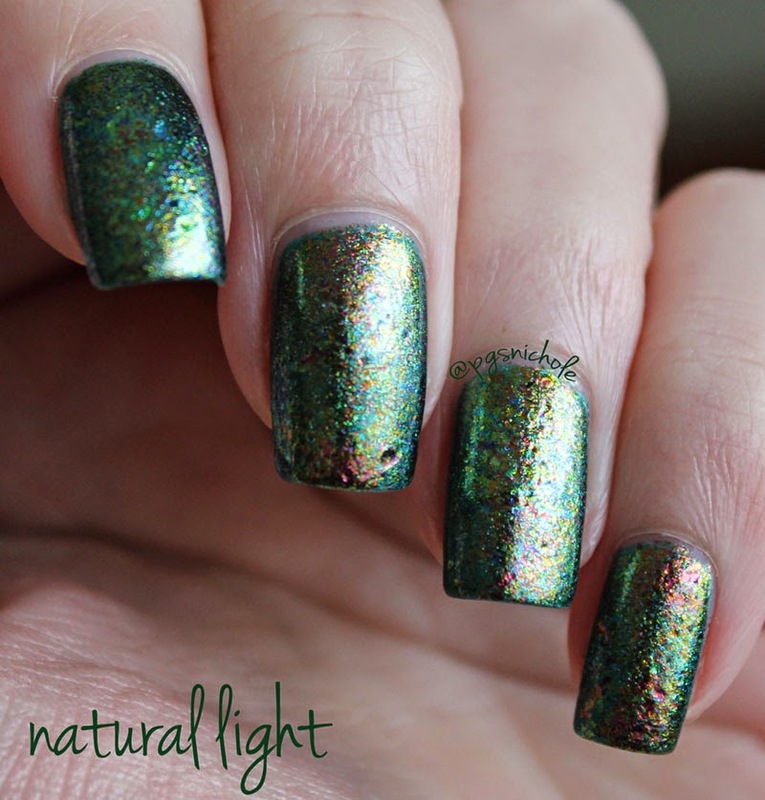 I also have one of the ILNP ultrachrome flakies, which I also love, but I feel like the Digital Nails Urban Achievers collection is more unique and interesting. Plus I'm a sucker for anything Big Lebowski. you guys are not helping my "no buy"...I mean, I'm not either...but now I can blame you guys!